Our DVD of SIX DAYS IN ROSWELL won a 2001 DVD Association Award! Did you know that a UFO sighting occurs somewhere every three minutes? If you have ever questioned whether real life is stranger than fiction, put your doubts behind you as the filmmakers who brought you the comedy hit TREKKIES take on Roswell, New Mexico. SIX DAYS IN ROSWELL probes both the fanatic-like following that has sprung up around reported extra-terrestrial encounters, as well as featuring top alien experts like Whitley Streiber (COMMUNION), Stanton T. Friedman and Don Schmitt (THE TRUTH ABOUT THE ROSWELL CRASH). 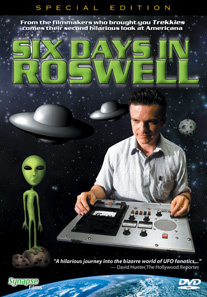 SIX DAYS IN ROSWELL is loaded with special features and is the perfect DVD addition to any science-fiction fan’s video library. Early 8mm Short Films and Video from Director Tim Johnson, Producer Roger Nygard and Star Richard Kronfeld.